The NTX16 PCI Express Recorder records and plays more than 800 megabytes per second. The NTX16 PCI Express Recorder records and plays more than 800 megabytes per second. It supports high-volume data streaming applications, such as high-speed data acquisition, high-resolution video, satellite data downloads and digital signal processing (DSP). The equipment features direct peer-to-peer streaming across a PCI Express cable interface for applications requiring high-bandwidth data capture. It can operate as a standalone system with network control or can be directly connected to a host computer with a PCI Express eight-lane bus interface. 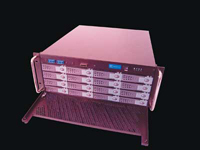 The 4U (7- inch) high chassis accepts up to 16 storage drives, for 32 terabytes of storage capacity.